The deceptively simple buzzword of the season, “giving”, is so much larger -- you’re asked to give time, energy, patience, money and sometimes to give up your rhythms, your personal space. Logically, you can only give from what you have. And yet there’s pressure to give and give, no matter what you’re drawing from. It’s important to make sure to fill your own well of inner resources often. An emotionally or energetically depleted state leaves your body open to illness at a time when you’re often exposed to more people. This is why self-care is so important at this time. Taking charge of tending your own personal wellness ensures that it happens just the way you need it, not to mention the energetic boost that comes from getting something done that provides your body with love and attention. Self-care doesn’t have to take a lot of obscure equipment, but the just the right tool for the task can make all the difference. We at the dhyana Center test many different items and work to home in on the indispensable products that provide a maximum benefit to your self-care practice. 1. Warm up and keep your circulation going with a Salt Scrub. This is a workout in itself that leaves your skin exceptionally smooth and nourished with oils. 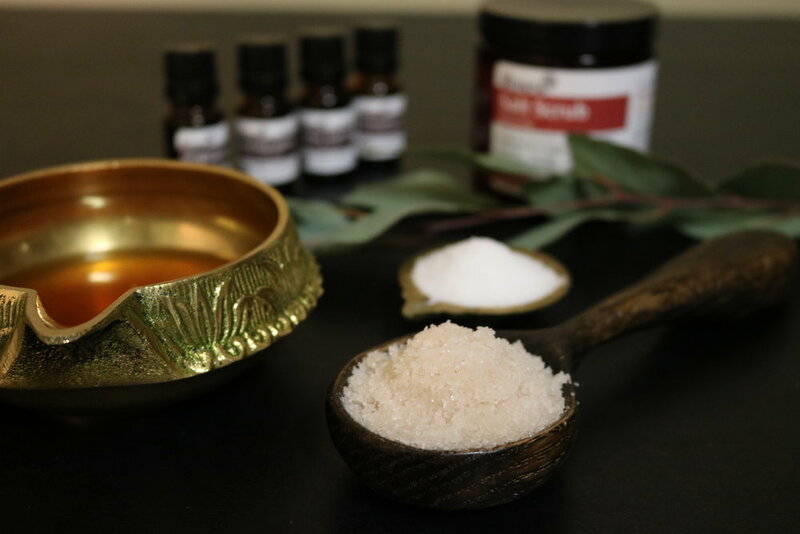 The dhyana Center has a line of hand-crafted salt scrubs that are tailored to different individual needs. Scrub in your bathtub or shower, standing on a wet washcloth to prevent slipping. This will get a little messy! Take a small handful of salt in your dry hand and rub it into your skin, working from feet to heart, hands to heart. Work the salt into your skin in a circular motion until the skin turns pink. Then move on. Once you’ve worked your entire body, simply rinse the salt away. Salt is naturally deodorizing, so soaping up isn’t necessary. You’ll notice the water beads from the oils that have soaked into your skin. Pat dry with your towel to hold the moisture. Salt scrubs provide a few benefits -- it’s a good practice for getting grounded in your body, it nourishes and moisturizes the skin driving nutrients and medicine into the bloodstream, and it helps ensure that your blood and immune system are moving toxins out of the body. Regular salt scrubs prevent stagnation that can come from long hours sitting as you travel, slow digesting foods, and disruption of your ordinary fitness routine. 2. In contrast to the salt scrub is our decadent Sugar Scrub bars. Where a salt scrub is therapeutic, a sugar scrub is luxurious. The dhyana Center medicine makers hand-mix our sugar scrub with fine-textured sugar for a gentler exfoliation. The blend also contains beeswax for a result similar to a paraffin wax treatment. This is beneficial during winter to hold precious moisture within the skin. After your scrub, you’ll feel a thicker, softer, long-lasting coating on the skin that is smooth and nurturing. You’ll also benefit from a warming blend of essential oils and is more warming to tissue. After your shower, warm the bar in your hands until slightly melted, gently buff your skin, then rinse. Pat your skin dry to keep the coating preserving moisture in your skin. This is particularly good for isolated areas that are chapped, scaly skin, and clogged pores. One bar can last several showers. 3. You’ve filled up on a fantastic dinner. There’s one more little touch that can benefit you in ways you may not realize -- the simple toothpick. It may seem like a bit of a throwback your grandfather would use, but this is no ordinary wooden stick. The dhyana Center steeps pure bamboo picks with essential oils for our new Digestif Toothpicks that support good dental health. Take care to gently work the narrow end of the pick at your gum line to remove any stray bits of food, reducing tooth and gum decay. And here’s an added bonus. Often we eat sweets at the end of the meal to tell our brain that we’re officially “done” with eating, or pop in a hard candy or reach into a bag of chips because the mouth likes something to do, or crave sugar out of boredom. Our toothpicks are a handy way to combat these actions as the essential oils curb cravings and the pick helps send the signal of a completed meal. Toothpicks are a little habit worth having. 4. Whether it’s the chilly start of the day or while the temperatures drop at night, a cup of tea is just right. Herbal teas help with hydration just as much as a glass of water, and the warm liquid assists with good digestive movement in the body. Make sure your tea also delivers herbal medicine that’s supportive at this time of year. Autumn and Winter are drying, cold times. Now is the time for Nourishing or Warming Blend teas. If you already tend to run warm, try the dhyana Center’s nourishing blend to make sure that your natural inner fire coupled with indoor heaters don’t dry you out. If you struggle with sweets or tend to overindulge at the festive season, look to the warming blend to help keep your inner fire stoked to ensure your digestion can take on any heavy foods. Feeling stagnant and sluggish can put you into a cycle of lower body temperature prompting even less movement, so a warming blend will help keep you fired up and active. Founder DeAnna Batdorff recommends blending the two for a special treat! 5. And when you’re feeling like moving, take a gua sha in hand to inspire effective lymphatic flow. You’ve probably heard us talk a lot about the lymphatic system and how important it is to maximum wellbeing. Your immune system is supported by a healthy lymphatic system and utilizing a gua sha to activate and tone that system is one of the most powerful tools you have. The lymphatic system is close to the skin’s surface, branching throughout the body. Bring the edge of your gua sha to meet the tissue under the surface of your skin and rub it back and forth in a small movement. Whether you rub gently or more deeply, you are helping move lymph, which keeps it circulating toxins out of the body. Start from the outer areas of your extremities and move your gua sha toward the heart. This is part of moving the lymph toward the area where it dumps toxins to be removed through our excretory system. If your skin feels sensitive to the rub, let up a little and know that you will benefit from more use of the gua sha. So take it up instead of scrolling through social media, or while you’re checking email, or make a special time in your day to gua sha larger areas of the body. Target one area (hips and pelvis is a great one) for a long daily practice to see how it changes over time. Or work half your body one day and half the next, alternating your care. Don’t forget your face, jaw, and scalp! 6. Finally, boost your immune system effortlessly by placing a Steam Tablet in the back of your shower to infuse your shower steam with immune-boosting essential oils. These hand-pressed tablets are new for the holidays and they smell amazing. They activate when tiny water droplets of steam begin to automatically dissolve the tablet and carry the a fine mist of oils deep into your lungs and bloodstream, protecting and strengthening your system that may be dry from the air in our local community to heaters running in homes and businesses. If you’re feeling particularly sick or want a deeper healing, dissolve a tablet in a pot of boiling water and inhale the steam more closely. You can also dissolve the tablet in a stove-top pot to suffuse the air in your house with preventative immune boosting power. Consider self-care tools as gifts for others and for yourself. Bundle a few tools in a basket or drawstring bag or purchase a pre-curated kit for a gift they’ll talk about for years to come. What better way to send a message of love and encouragement by letting someone know they’re worth caring well for themselves. And you’re worth it, too! Stay tuned for the next installment of our holiday self-care series!